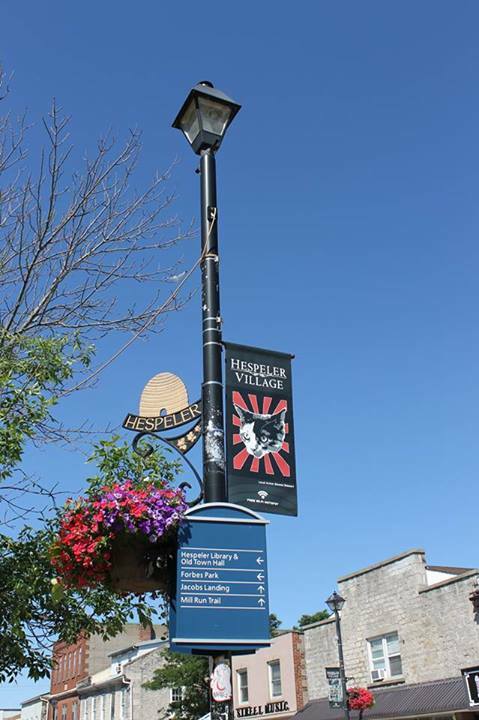 If you happen to walk downtown Hespeler, make sure to look up at the light-post banners. 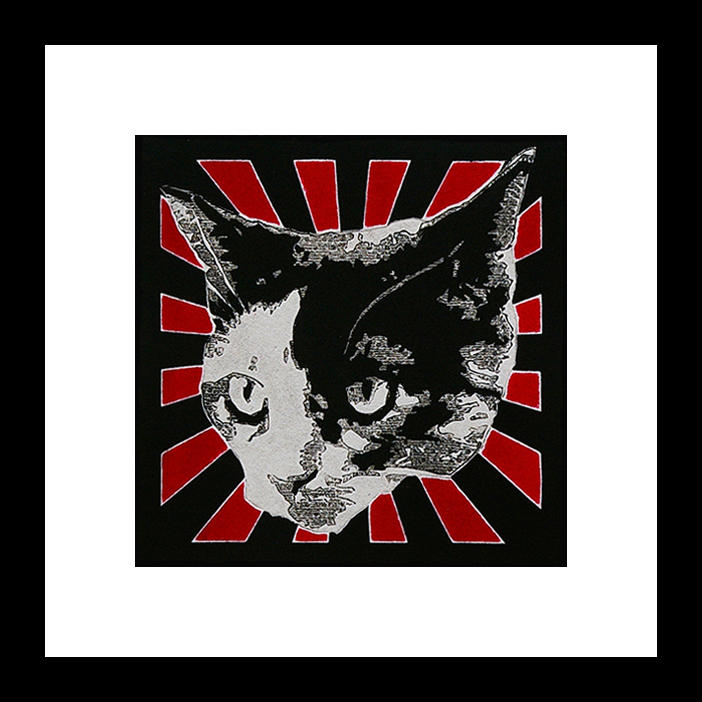 You’ll see black and white pop-art cat named Lucy – a delightful piece created by Cambridge printmaker, Donna Stewart. 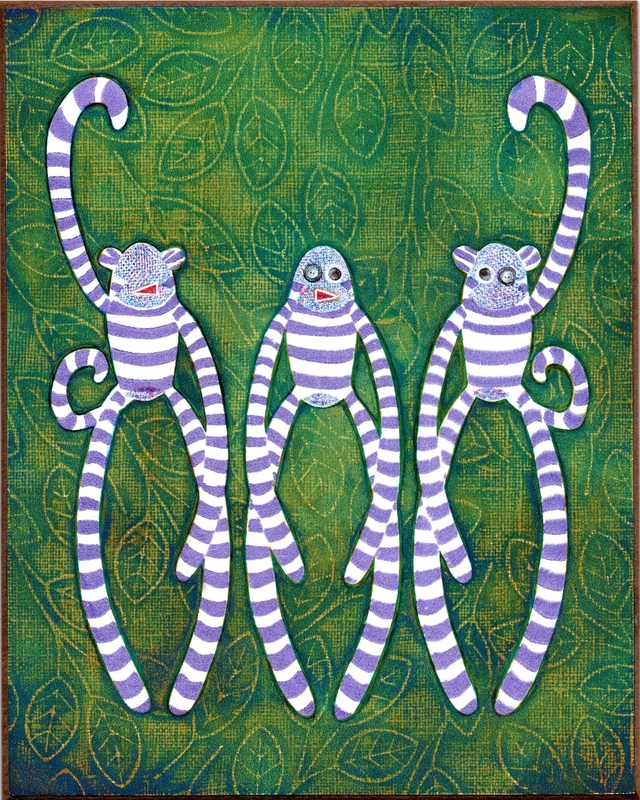 Cats, sock monkeys and Converse sneakers are just a few of the objects that inspire Donna’s creativity. “For a while, my work was pretty serious but I feel like I’m in a more playful, colourful phase right now,” says Donna. And the village of Hespeler (in Cambridge) must agree as Donna’s work is proudly decorating the city streets, heralding it a creative and dynamic place to be. 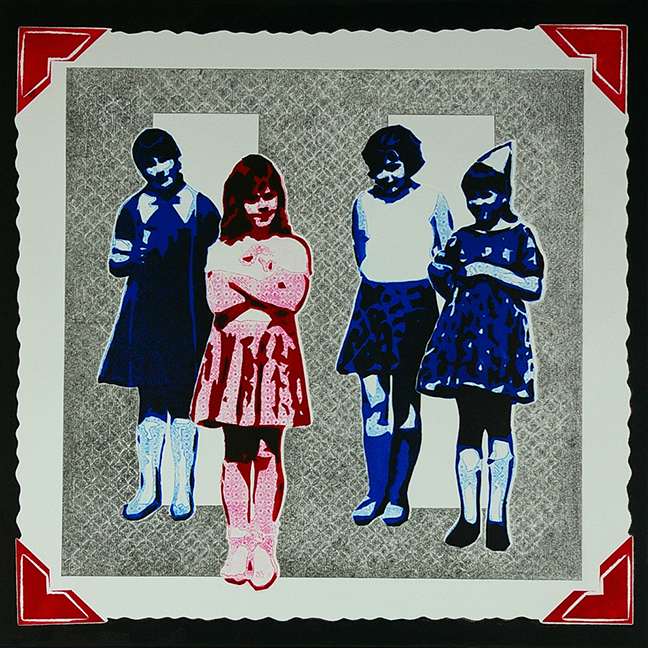 She practices intaglio etching, which has a long history of requiring hazardous chemicals to produce impressive results. However, Donna experiments with different non-toxic printmaking methods to make it a safer yet equally effective process. “I’m using acrylic media these days with lots of trial and error to find the right mix, but I haven’t found a magic bullet yet,” says Donna. But the experimentation is part of the fun. 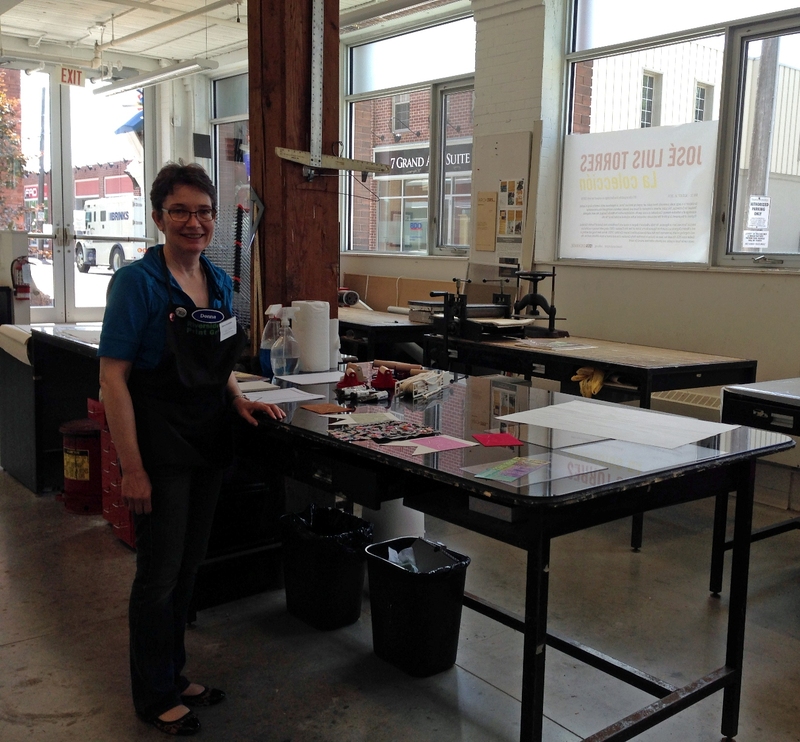 Like many art forms, print making is often a solitary process. She says, “I like to design and then craft a new plate on my own, because I’m doing a lot of thinking; the whole process can take several weeks.” However, when she prints, she’s typically surrounded by fellow printmakers. Beyond her own artistic work, Donna is the vice-chair of Hespeler’s award-winning A Day & A Night Art Meets Music Festival, which was the winner of the 2013 Arts Awards Waterloo Region – New Festival or Event Award. 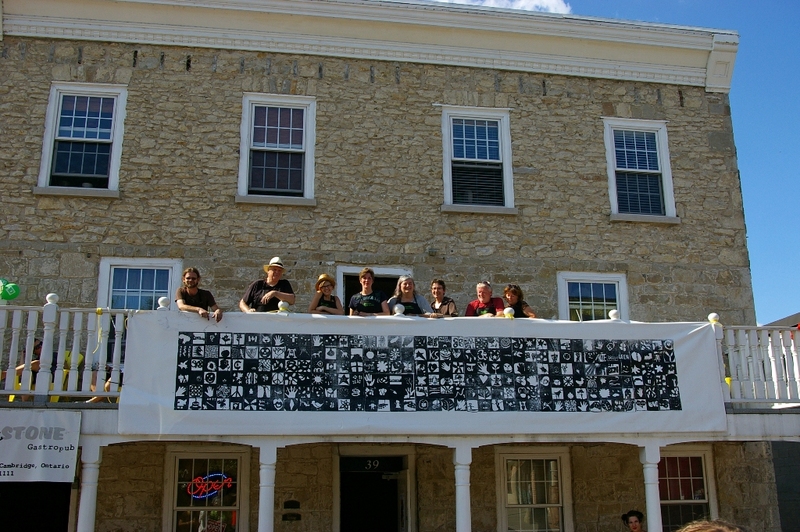 At her design, the Riverside Print Group collaborated to produce the BIG Print Community Quilt as part of last year’s festival. You can see Donna’s work (and that of the other Riverside Print Group members) this October at the Carnegie Gallery in Dundas and at Kitchener’s Homer Watson House and Gallery during November and December. And of course, make sure to attend the fourth-annual A Day & A Night Art Meets Music Festival on Saturday, August 23 to get your fill of art, music, culture and community. And you can check out this year’s big community art project: The Big Weave.